From the National Institute of Women, Children, and Adolescents Health Fernandes Figueira (IFF)–Fundação Oswaldo Cruz (Fiocruz), Rio de Janeiro, Brazil. Brazil has been experiencing an outbreak of Zika virus, a flavivirus transmitted by Aedes mosquitoes. Since October 2015, more than 4,000 infants,1 born to mothers suspected to have contracted this infection during pregnancy, have microcephaly1,2 and CNS malformations (figure 1), including parenchymal and periventricular calcifications, ventriculomegaly, and cortical migration anomalies.2 This suggests marked viral neurotropism. 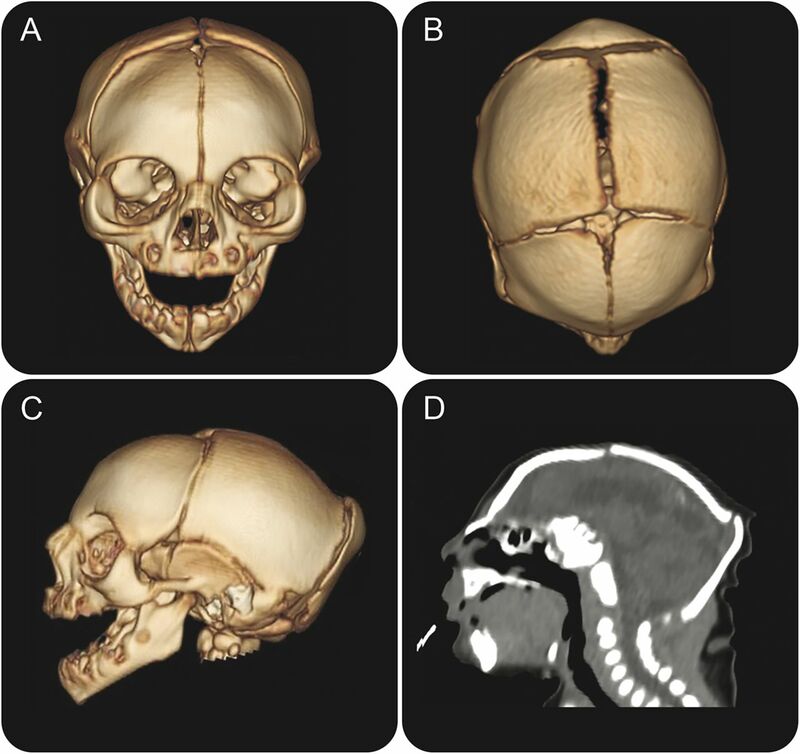 Upon performing CT, cranial malformations (figure 2) with a pointed occiput are also observed. (A–C) Severe brain abnormalities are being observed in infants prenatally exposed to Zika virus infection. The image illustrates a repeating pattern among these patients: cerebral atrophy, pachygyria, lissencephaly, parenchymal calcifications, and ex vacuum hydrocephalus. Anterior (A), superior (B), and lateral (C) views show significant microcephaly, small anterior fontanelle, and occipital protrusion in infant whose mother had infection compatible with Zika virus in the first trimester of pregnancy. (D) Sagittal CT shows redundant scalp and cutaneous folds in the occipital region. We hypothesize that the extensive brain destruction may lead to collapse of the upper cranial bones over the occiput, pushing it backwards, causing this peculiar malformation. Author contributions: D.D.G. Horovitz: corresponding author, saw and examined patients, searched literature and wrote manuscript. M.V.S. Pone, S.M. Pone, and T.R.D.S. Saad: authors, saw and examined patients, revised and discussed examination findings, and revised manuscript. M.C.B. Boechat: performed and described imaging studies, discussed examination findings, selected and prepared images for manuscript, and revised manuscript. Disclosure: The authors report no disclosures relevant to the manuscript. Go to Neurology.org for full disclosures. Brasil Ministério da Saúde. Centro de Operações de Emergências em Saúde Pública sobre Microcefalias: Monitoramento de Casos de Microcefalia no Brasil. Informe Epidemiológico 13–Semana Epidemiológica 06/2016 (07 a 13/02/2016) Brasília: Ministério da Saúde, 2016 (in Portuguese). Available at: http://combateaedes.saude.gov.br/images/pdf/Microcefalias_Informe_Epidemiologico_13_SE_06_2016_17fev2016.pdf. Accessed February 24, 2014. Possible association between Zika virus infection and microcephaly: Brazil, 2015. MMWR Morb Mortal Wkly Rep 2016;65:59–62.